Eylon Sorek, Skyx Founder and CEO has been interviewed by RobotUnion’s team. Skyx is an agricultural-robotics technology company enabling a modular swarm of autonomous drones for spraying. The company was founded by Eylon Sorek and Dr. Itzik Turkel, developed its initial prototype and commercial traction, accelerated at MassChallenge and IMPACT, and completed its first funding round from Rimonim Agriculture VC and Israel Innovation Authority. They are expecting to sign their second equity-based funding round at 3Q 2018. This will speed up their commercialization in strategic markets and strengthen their engineering resources. How will your innovation disrupt the agriculture sector? Today’s cost, accuracy, availability, and safety problems caused due to the current manual spraying operation that is based on one person + one big machine. Normally, they spray by covering the entire farmland and applying pesticides uniformly. Their challenge to apply variable rate spraying is the root cause for most of their problems, as well as for our disruption. High equipment cost and low utilization. Poor accuracy at curves and near obstacles. Fixed size boom. Crop trampling may occur. Limited availability: hard to find, train, and trust drivers. Cannot spray after heavy rain (when needed most), limited at mountains. If a vehicle gets a flat tire, a working day is lost. We overcome these problems and disrupt this entire operation by replacing the single and big airplane or tractor with a group of small, accurate, and cheap robots, and by replacing the single pilot/driver with autonomous technology. Have you identified direct competitors in your field? If so, what does Skyx bring to the market that other companies working on automated crop-spray do not provide yet? Prosumer drone vendors introduce commercial drones for several verticals, including spraying. They focus on building the hardware and have a generic spraying approach without agriculture considerations (they cannot tell the difference between spraying barley versus spraying potatoes). They have no swarm concept and no software to enable multivendor interoperability. They mostly target the small individual grower and reuse for him space coverage algorithms that they already use in high altitude imagery missions. For drone vendors, spraying is a niche market and the drone is the product. For us, the drone is the tool and spraying is the mission. Skyx is not drones manufacturer. A sustainable competitive advantage we have is our spraying mission planner that compiles agriculture requirements regarding the specific crops and pesticides. This makes Skyx an agri-robotics technology company and not a generic software provider of flight planning. 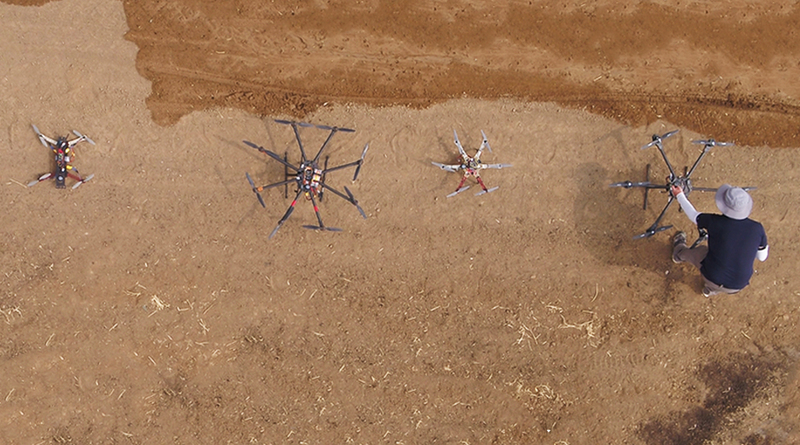 In addition, our unique technology enables a modular swarm of spraying drones. In this optimized swarm, each drone can have different controllers and sensors, and the swarm can include drones from different vendors. Our proprietary space coverage algorithms are designed specifically for agri-spraying. Our solution concept is for industrial farming and we target professional applicators and large growers as our users. Agriculture machinery vendors that build large sprayers like tractors and airplanes. Their spraying concept is based on driving/flying the entire farmland and controlling the nozzles. Tractor companies have no experience with aerial gear, and airplane companies have no experience with drones. Their comfort zone is to design stand-alone and large products that are operated manually. For agriculture machinery providers, bigger (tractor/airplane) is better. For us, an autonomous and modular swarm can do things that the driver/pilot cannot. Our competitive advantage is based on introducing a totally different spraying solution: an autonomous swarm of relatively small, smart, and cheap drones with an optimized allocation of all resources to apply hotspots spraying on an unlimited number of hotspots of all sizes and shapes in the farmland. We know how to translate crop scouting and agronomists’ prescriptions to precision spraying and how to save a significant percentage of pesticides (we spray only where it is needed and only the required amount). The long-term vision combines any 2D and 3D equipment as well as manned and unmanned equipment to achieve the most precise, available, safe, and affordable spraying. The vast majority of UAVs in agriculture are used for crop scouting and therefore a single drone that flies high above the farmland has similar challenges like other inspection applications. Image processing challenges are out of this scope. At Skyx we use a drone for spraying and this introduces new and unique challenges. One example, due to the extremely low altitude, is bypassing static and dynamic obstacles. Another example is payload – how should we optimize the usage of small drones in a large farmland. My last example is about space coverage – unlike uniform coverage of traditional gear, we would like to send the drones to travel between unlimited number, sizes, and shapes of spots in the farmland. Our technology solution is originally designed to work out those challenges and we learned that any attempt to reuse non agri-tech solutions will simply not work at scale. What are the future steps that you are planning for Skyx? In the short-term: we identified the specific subset of crops, territories, and operators that ideally fit for our solution. This is one aspect of our go to market strategy. Another aspect is the design partnerships that we develop with other innovators in our space. And in the longer-term: a holistic view on agriculture spraying includes real-time imaging, autonomous base stations, and combined 2D and 3D robots in a single operation. We are building the infrastructure for this. What do you think that acceleration programmes like RobotUnion could potentially bring to Skyx? We already had extremely positive experience with Tier-1 accelerators such as MassChallenge and Impact Growth. Acceleration programs forced us to deeply review and develop our strategic, financial, and technology roadmaps. Doing this on an on-going basis together with highly experienced mentors and entrepreneurs is much better than sporadic improvisations.